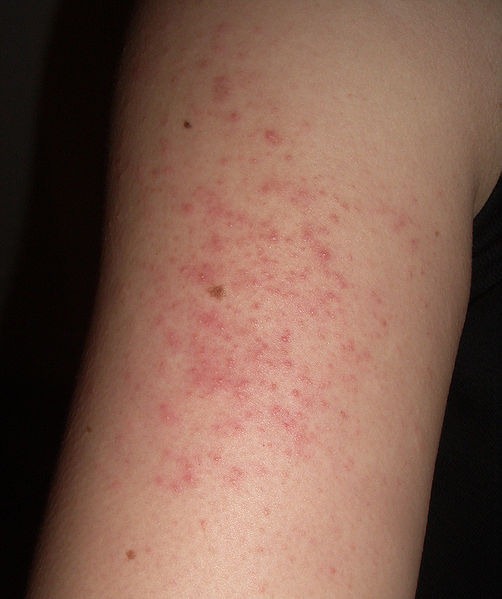 Keratosis Pilaris is a hair follicle condition. It can be thought of as hair follicle eczema. It most commonly affects the hair follicles of the upper arms, but can also affect hair follicles on the upper legs and occasionally on the face and other areas. Keratosis Pilaris affects the hair follicle in 2 ways. It causes the mouth of the hair follicle to become slightly elevated due to overproduction (hyperkeratosis) of skin in the area. That is why the condition feels rough to the touch. Secondly, it causes inflammation of the hair follicle, which results in the spotty reddish appearance of the affected area. The roughness combined with the redness can be unsightly and a source of embarrassment to patients. Like asthma and hay fever, the condition can not be cured, but it can be improved. The roughness can be treated with a moisturiser that contains Urea or Salicylic acid. It takes a few weeks to see good results. Sometimes retinoid containing creams, like Differin cream, needs to be used in addition to the moisturiser. An achievable goal is to improve the roughness by 80%. The redness is more difficult to treat. It improves slightly when the roughness improves, but in most cases additional anti-inflammatory preparations like mild topical corticosteroids, Protopic or Elidel must be used for short periods. An achievable goal is to improve the redness by 50%. The keep the Keratosis Pilaris under control daily use of moisturisers, with or without a retinoid cream and intermittent use of anti-inflammatory preparations are required. Remember, the goal of treatment is improvement and not cure.